London Fashion Week influencer marketing. How can fashion brands maximise their impact via influencer marketing? London Fashion Week starts tomorrow (14-18 September). The 68th edition features 80 on-schedule designers; 54 of them hosting catwalk shows, 26 presentations and more than 20 events. The fashion industry is big business, for the economy. Last year it directly contributed £32.3billion to the UK GDP ($41.8billion). At this London Fashion Week - in a nod to the continued blurring of traditional media and influencer marketing Millie Mackintosh, fashion, beauty and wellness influencer will curate part of the shopping galleries this season bringing together a mix of established and emerging designers across womenswear and accessories. Instagram is the current influencer marketing powerhouse platform. The image and video-led social media platform now boasts a billion monthly active users. 34% of all Instagram brand-sponsored influencer posts fall within the Fashion and Style vertical. To set this into perspective, Beauty - Instagram’s second largest vertical - generates just 21% of brand-paid content. UK influencer marketers pour more money into Instagram’s Fashion & Style sector than into any other vertical. But, how can fashion brands help their influencer marketing efforts gain high engagement rates with their target audience? 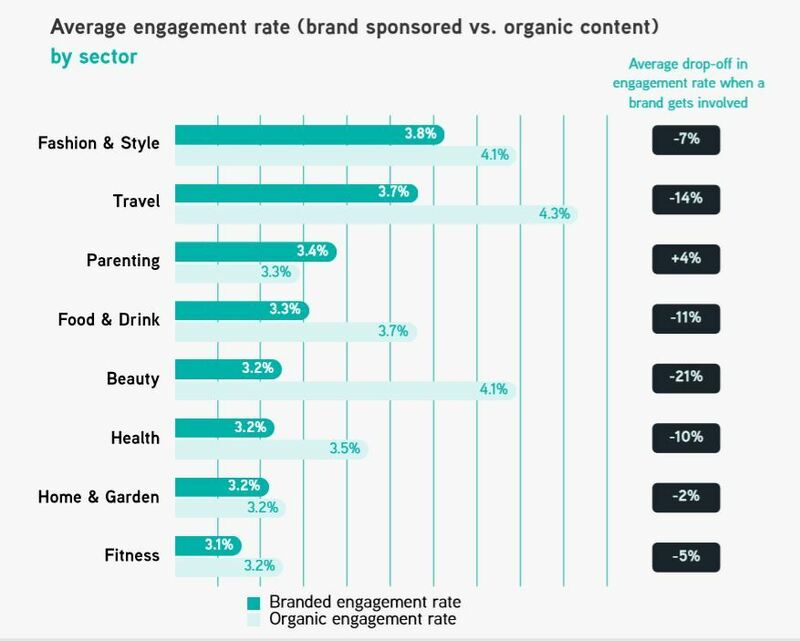 Research by CampaignDeus shows the average drop in engagement rate for the Fashion and Style on brand-sponsored versus organic content is 7%. To gain best results fashion brand influencer marketers should focus on building a systems-based approach. Benchmarks should form part of a standard methodology. Brands need to feel confident that when they form a working relationship with an influencer that the selection decision is backed by data-driven insight. Scoring past Instagram campaigns provides a good indication of future performance. Whilst 88% of high-end fashion sponsored posts are product placements these posts perform poorly when compared with event promotions, brand ambassador posts, competitions and giveaways. 63% of high-end fashion sponsored posts feature the influencer as the main focus. Makes sense on the face of it. The data shows, perhaps counter-intuitively given the visual nature of Instagram, that text-based post elicit the highest rates of engagement. Infact showing a full shot of the influencer ranks sixth in terms of average engagement rates. Full influencer actually underperforms worse in this vertical than images of pets, selfies, landscape-led shots and sponsored content which features an influencer’s friends and family. Whilst 30% of high-end fashion Instagram paid-for posts are filmed in a streetscape, the best performing engagement is when sponsored content is set within bars and clubs. 34% of high-end fashion Instagram paid-for posts are created and published by influencers with a following of 24k- 100k. 28% of influencers in this vertical have 100k - 250k followers. The size of audience for best-performing high-end fashion influencer marketing posts? Fewer than 10k. And, by a country mile. These micro influencers typically earn an engagement rate on their sponsored work of around 8.6% Whilst those with a following of 25k-100k generate just 3.7%. Yesterday the UK’s watchdog overseeing influencer marketing ruled that Made In Chelsea star Louise Thompson had broken advertising regulations. This influencer with 1.1m Instagram followers was forced to apologise for breaching advertorial rules with her influencer marketing post. It was the second time in as many months that Thompson had fallen foul of the Advertising Standards Authority. Influencer marketing disclosure rules in the UK centre on whether the paid-for piece of content is obviously identifiable as a marketing communication or not. Which admarks work best on paid-for content? Influencers use a variety of admarks on Instagram to designated paid-for brand relationships. CampaignDeus has provided data to demonstrate that not all admarks are weighed the same when earning engagement from paid-for content. London Fashion Week influencer marketing: Which admarks are best on fashion paid-for content? The independent influencer marketing benchmarking and measurement company found there is a significant negative variance when using an admarker such as #ad or #spon on paid-for content versus organic content. The variance widens depending on the admarker used. The most popular admarker is #ad with over 60% of marked paid-for posts containing this hashtag. 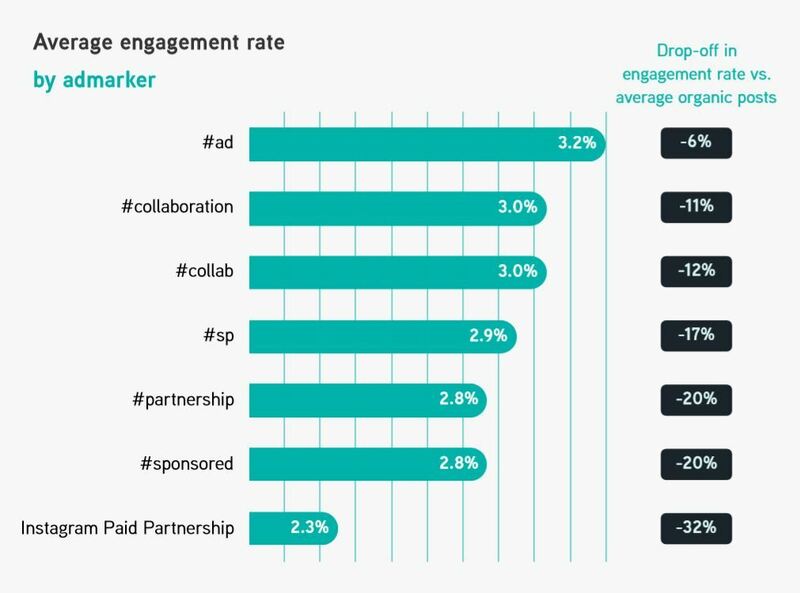 Further, average engagement rates on brand sponsored posts decline as account sizes grow. The drop-off between brand sponsored and natural influencer posts increases as account sizes grow. I discuss this area in more detail in my article: Is effective disclosure killing influencer marketing? Given the data supporting the benefits to high engagement rates of micro influencers the London Fashion Week digital influencer accreditation criteria seems out-of-date. Whilst content relevancy is covered by the final point above, engagement rates are not. Neither is the authenticity of each influencer's audience. There does not appear to be any provision for weeding out fake followers.